Melissa McCarthy’s Sean Spicer returned to the White House Press Room on “SNL,” kicking out Sarah Huckabee Sanders to retake his job. Entering from the bushes outside the White House, Spicer blasted one journalist with a fire extinguisher after he asked Sanders to take over Spicer’s job permanently. You can check out the full sketch up above. Spicer pulled out his trademark dolls to explain the White House timeline and justification for firing former FBI Director James Comey. McCarthy’s Spicer pulled out a Russian nesting doll that started with Trump. “You can tell because he’s the biggest and most beautiful,” Spicer explained. Spicer then popped out more and more dolls inside, using characters from pop culture as stand-ins for figures in the story — like Disney’s Maleficent for Hillary Clinton, Slimer from “Ghostbusters” as White House Adviser Steve Bannon and Pikachu as Attorney General Jeff Sessions. Finally, the press asked Spicer if he was lying about the Comey situation. Spicer insisted he wasn’t because he’d heard it all from the president. “But what if he’s lying to you?” One of the journalists asked. “But he wouldn’t do that, he’s my friend!” Spicer shot back. “Then why does he make you come out here and humiliate yourself every day?” they pushed on. A reporter then asked Spicey why Trump keeps telling him lies, which seemed to break Spicey’s heart. 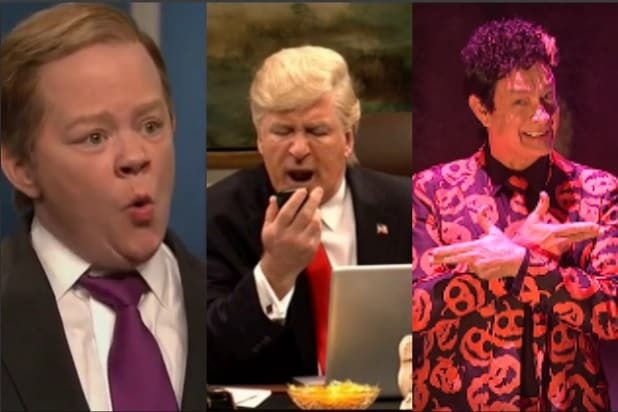 “He’s my friend!” Spicer insisted, then fired up his motorized podium and rode it to New York, taking to the streets to try to find Trump and fight for his job in a digital add-on that New Yorkers had seen “SNL” and McCarthy filming last week. Finally tracking Alec Baldwin’s Trump down to his New Jersey golf course, Spicer confronted Trump on whether the president had ever asked him to lie. “It’s okay, I’m famous,” Trump said, before sweeping Spicer off his feet in a deep kiss.